It’s that time of year again! Fall has officially settled in as the crisp air has moved into the West Virginia mountains and crunchy leaves have started to fall. Our market is full of the sweet smells of cinnamon, nutmeg, brown sugar and vanilla as we’re baking all of the apple cider donuts and scrumptious apple pies our customers enjoy so much. For our pies and other baked goods, we only use the best ingredients. We know exactly where our apples come from because we grow them! And you can purchase the same apples we use for our pies to make your own delicious desserts – or just eat them on their own! We’ll be running our Apple Harvest Bin Special from September 20 to November 17 this year. This year we’ll be offering several of our most popular varieties of apples in our bins. Get the chance to mix and match freshly picked apples that come straight from the trees. And, you can pick from these bins at a reduced price! If you’ve never tried a mile-high apple pie, go for it this year! Check out this recipe using Winesap apples (and a few others) here. Also, find some of our favorite apple recipes here. Due to limited space, we’ll only be offering three to four of our most popular varieties in the bins at any given time. The availability will be seasonal to what is being picked at that time. Other varieties will be offered in our regular display just like we do all fall/winter/spring. To know what apples are being offered at what times during the season, check our Facebook page for updates, or call our Harvest Hotline at 304-263-1168! More information about our Apple Harvest Bin Special can be found on our website, or stop into the market Monday through Saturday from 8am to 6pm and on Sundays from 10am to 4pm. We look forward to seeing you on the farm! 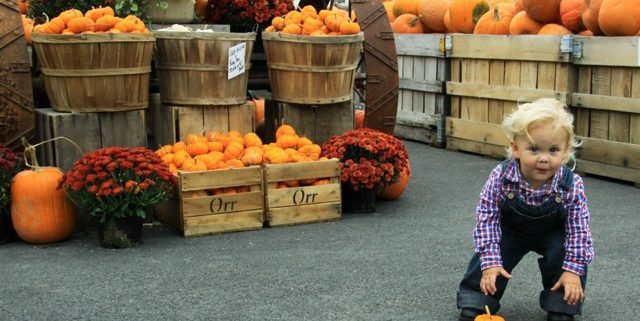 One of our favorite things about fall is welcoming in the season with our annual Fall Farm Fun Days. There’s just something so fun and entertaining about a great festival with some of the best regional bluegrass, local vendors with delicious food and wonderful crafts, children’s activities, hayrides and pumpkin picking. This year we’re also featuring a LIVE visit from Spookley the Square Pumpkin! You’ve probably seen his popular kids’ movie on Disney Junior. He’ll be walking around both days to greet the children between 11am and 4pm. We are hosting The Hazards, Stoney Creek and Ernie Bradley & The Grassy Ridge this Saturday and Sunday for our Fall Farm Fun Days! These shows are from 10am to 4:30pm on Saturday and 10am to 4pm on Sunday. Another fall activity that we enjoy are our Bluegrass weekends. They’re a wonderful way to spend the day relaxing with your family. You can come out to the market to hear some of the region’s best bluegrass music while shopping, picking your own fresh fruit, or simply taking in the crisp fall air. Sounds like a perfect weekend plan to us! With no holidays these next few weekends, celebrate the fall by coming out to hear the live music, enjoy delicious farm-fresh food, and shop for local, healthy goodies. We hope you join us for Fall Farm Fun Days and other bluegrass weekend performances! 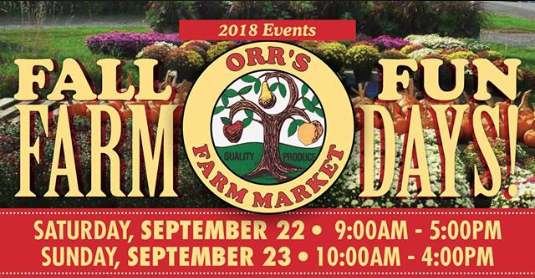 These shows are a great way to show support for local musicians, take in the fall weather while it’s still nice out and enjoying fresh fruit from Orr’s Farm Market. https://orrsfarmmarket.com/wp-content/uploads/2018/05/26219872_10155636733189475_5536498741358352079_n.jpg 720 960 Orr's Farm Market https://orrsfarmmarket.com/wp-content/uploads/2017/03/Orrs_WebHeader_2017-1.png Orr's Farm Market2018-09-19 10:53:352018-08-28 10:57:53Spend Your Fall at Orr’s! Around here, when we think fall, we think apples. This deliciously crisp fruit come in lots of varieties, and each one has their own special taste. With all these yummy flavors, it can be hard to navigate which variety of apple should go in what type of recipe. With years of expertise, we feel like we can accurately guide you in finding your new favorite fall recipe. Here are a few of our favorite recipes we’ve collected over the years! We know some people have issues with pineapple on pizza, but how about apple? At Orr’s, we love all types of fruit on pizza and this yummy Maple Apples, Blue Cheese and Bacon Pizza is the perfect comfort food for colder fall days. The sweetness of golden delicious apples with the combination of the creamy blue cheese and salty bacon makes this pizza one to die for. There’s something about apple butter takes us right to the feeling on fall (even if the weather isn’t cooperating). This recipe turns the best Cortland apples into a delectably sweet spread you’ll want to put on everything. Check out this slow cooker apple butter recipe that’s sure to put you in the fall spirit. If you don’t feel like waiting on this recipe to cook, pick up come apple butter in our market! Looking for the perfect salad to go with your next dinner or potluck? Look no further! This spiralized apple cranberry salad is yummy to say the least. It’s crunchy, creamy and sweet, so it’s sure to please every crowd. It’s great with granny smith apples or pink lady apples, so you can use either, or mix it up and use both! These easy caramel apple trifles are a perfect way to end the night. They’re simple to make with just cinnamon apples, cinnamon whipped cream, cinnamon granola and caramel. Each of these items you can buy in a store for an easy dessert, or you can follow this recipe for a more homemade, authentic taste. For this recipe, we recommend Honeycrisp apples because they complement cinnamon and caramel so well. We hope you enjoy a few of these yummy apple-filled recipes this fall. For all your apple needs, come see us at Orr’s Farm Market! We carry plenty of varieties of West Virginia grown apples and would love to share them with you! Come see us! September has arrived! And with this change in month also comes a change in season. As the crisp air moves into our region and leaves beginning to turn colors, we can’t help but become excited when we think of the possibilities that come with fall. Our summer fruit starts to transition out while our delicious apples start to make their presence known. And we can’t forget about our apple cider donuts too! Come celebrate the fall season with us at our Fall Farm Fun Days! Be the first to pick some pumpkins from our patch while enjoying live music, visiting our vendors, eating yummy baked goods and seeing Spookley the Square Pumpkin! Fall Farm Fun Days are on Saturday, September 22nd from 9am to 5pm, and Sunday, September 23rd from 10am to 4pm. Take a look at the bluegrass bands we have booked and the list of activities below! We hope you join us for Fall Farm Fun Days! It’s a great way to kick off the fall season while supporting local vendors and musicians, and as always, enjoying fresh fruit from Orr’s Farm Market. https://orrsfarmmarket.com/wp-content/uploads/2018/08/Screen-Shot-2018-08-28-at-10.43.15-AM.png 278 535 Orr's Farm Market https://orrsfarmmarket.com/wp-content/uploads/2017/03/Orrs_WebHeader_2017-1.png Orr's Farm Market2018-09-06 10:36:202018-08-28 10:47:28Come Celebrate the Season with Us!